These lovely magnetic bookmarks are definitely my bestsellers! Made from 300gsm cardstock, they are thicker and sturdier than your average bookmark. 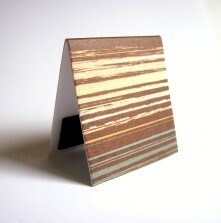 This one is embellished with brown textured striped scrapbooking paper. It measures approx. 4.5cm x 5cm (folded). With a high quality finish you can be confident that you are purchasing a gift that is unique and well-made. With their durable design they make great long-lasting gifts for Kris Kringle, Father's Day, teachers, pupils, bookclub members - in fact, anyone who loves reading! If paying by direct debit, please email seller for bank details.